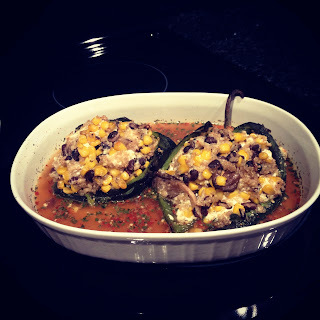 Stuffed with quinoa, black beans, mushrooms, and corn, these peppers make a satisfying vegetarian main course. Poblanos are among the mildest chiles, although they offer a nice zing! Chipotle chiles are smoked, roasted jalapenos, usually sold in cans with a spicy adobo sauce. 1. preheat oven to 475 degrees. on a parchment-lined baking sheet, rub poblanos with 2 tsp oil. roast until slightly blackened and softened, 15-20 minutes, turning once. remove from oven. when cool enough to handle, remove skins with paper towels. use a paring knife to make a small slit in each chile, then carefully remove seeds (and discard), keeping stem end in tact. 2. in a blender, combine chipotle, garlic, 1 tsp salt, and 3/4 cup water, season with pepper. blend until smooth. add cilantro, and pulse once to combine. 3. in a small saucepan, bring 2/3 cup water to boil. add quinoa; return to a boil. stir once, cover, and reduce heat to simmer. cook until quinoa is tender, but still chewy and has absorbed all liquid, about 15 minutes. fluff with a fork. 4. meanwhile, in a large skillet, heat the remaining 1 tbsp oil over medium-high. add mushrooms and 1/2 tsp salt; season with pepper. cook, stirring occasionally, until mushrooms are tender, about 5 minutes. add corn and beans, and cook, stirring until heated through, about 2 minutes. stir in 1/2 cup goat cheese and the quinoa.